The rite of passage for any filmmaker is making that first short film, which is where filmmakers cut their teeth and truly come of age. They learn about filmmaking by making a lot of mistakes -- big and small. It’s perhaps the cosmic filter system to weed out the unworthy or the unwilling. It’s also an epic journey through the highest of peaks and deepest of valleys as novice filmmakers quickly learn that it’s not as easy as just having a few people, a boom mic, and a camera. Filmmaking is hard. It’s hard to make an amazing film. It’s hard to make an average film. It’s even hard to make a terrible one. Below are nine essential tips that can help filmmakers prepare, produce, and navigate through the many trials and tribulations of making those first few short films. It’s okay to set lofty goals and have grand aspirations, but the worst thing that you can do is go into the process wide-eyed with high expectations. You need to be realistic. You need to stay grounded. The moment you begin to believe that your projects will get fully financed by approaching venture capitalists, local doctors or dentists (local rich people in general), investors, or through pre-sale distribution, is when you’ll soon realize that what you’ve read in a lot of independent filmmaking books is a myth. Furthermore, before production even begins, don’t set your heart on submitting it to the Oscars or getting accepted into prestigious festivals like Sundance, Austin, and Cannes. Set your heart on just finishing the film, because that’s a major accomplishment right there. Dismiss the additional delusions of grandeur that your short film is going to make you a star and the powers that be in the film industry will be tripping over themselves to proclaim you as the next Quentin Tarantino or Wes Anderson. Stay grounded. Stay real. The best filmmakers are less concerned about the dream scenarios and more concerned about just telling their stories in the best possible way they can. What’s meant to happen beyond that is out of your control. The filmmakers that are successful in crowd funding know that it is a full-time, pride swallowing pit of a desperation and despair. You need to be overly and ridiculously active on Facebook, Twitter, and any other social media outlet that I’m too old to know. It’s 30-40 some days of endless Facebook posts, Tweets, and emails -- all of which have you begging not just strangers, but mostly friends, family, and relatives -- for money. You will be overtaking their social media feed with countless requests for money from them and from everyone they know and you can’t let up for one single day or night until you’ve met or surpassed your dollar amount goal because remember, if you don’t raise the full amount, you don’t get one single penny and all of your work is for naught. And with that, there are responsibilities that you will have if you do make your goal. Through most crowd funding, you promise certain packages that backers choose to invest in -- their name in the credits, DVD copies, posters, t-shirts, and whatever else you’ve promised. Those things cost money, so you need to be sure to budget beforehand, otherwise you’ll see that $10,000 you’ve raised suddenly become more like $6,000 after expenses, processing, and shipping. Keep your integrity and be sure to know your responsibilities beforehand because -- and this is from personal experience -- there’s nothing worse than having to go to your backers to request that they further support your film by “donating” their rewards to save costs and have the money go to the production. Respect backers and remember that without them, you have no money to shoot in the first place. And finally, yes, know that one crowd funding campaign is likely your last. First and foremost, you’ll be so tapped out from the experience that going through it again would be like facing the fires of hell one more time. Secondly, you can only beg your family, friends, relatives, co-workers, and everyone they know for money so many times. One to be exact. You don’t need people to just say the lines -- you need actors. It’s one thing to use your friends and family (i.e. free labor) as grips and PAs. It’s a whole different thing to utilize them as your cast. Bad acting will kill a short film the moment it shows up on the screen and audiences can smell a bad and self-aware actor a mile away. Your casting, especially for your lead(s), will be everything in the end -- for you can shoot an amazing performance on a simple stage and still make it compelling. A great actor will draw an audience in with their performance. So go to your local universities and theater companies. Find the nearest talent agencies that handle booking models and actors for local commercials and print. Put ads online and in the paper. The actors will come. They’ll come from near and far if you play your cards right. They’ll come for the chance to act out their passions and they’ll come for the opportunities to add to their resume and reel. And you must audition, audition, audition. Seeing just two actors for a key role isn’t enough. And you can never settle. You can never settle for an actor, especially for one of the leads. Whoever you cast will make or break your film, plain and simple. So audition, audition, and audition until you find the one. The one that doesn’t just read the lines, but becomes that character before your eyes as your jaw drops to the ground in awe. And finally, audition your crew as well. Take the time to choose your sound designers, your editor, your film composer, and especially your cinematographer. Examine their body of work and pay particular attention as to how they seem to carry themselves. Can they work well with you? Can you work well with them? When you sit down with them and talk about their body of work and their thoughts on the project, what you’re really doing is auditioning them. Audition, audition, audition. Cast and crew. The lighting, lenses, and camera work is so utterly important with short films. If you can create something that looks feature worthy, you’ll be doing yourself and your actors a grand favor. And yes, while some screenwriters will hate this fact, in short films the visuals are sometimes more important than the depth of story. So many great short scripts have been so utterly undersold by pour production value and lackluster visuals. So find the most visually enticing locations you can. Hire or partner with some talented lighting technicians and an amazing cinematographer --and hope that they have some great equipment. And if they don’t, put a good amount of your budget into finding some through local companies, news stations, or universities. And if you have special effects to deliver in your story, make sure you can truly deliver on them visually. Cinema is a visual medium. Make your short film worthy of that medium. Along with visuals, pay particular attention to quality sound, which includes musical score. There’s nothing worse than watching a short film that utilizes only the captured audio from the camera or an otherwise lackluster audio track. Have an audio system and someone that can run it. And do your best to find a talented film composer, because music is also so vital to the cinematic experience and can also offer the cheat of filling in transitional and quiet moments within the film. You as a filmmaker need to stand out amongst the rest, thus your short films need to do the same. There are a belly of short film cliches that haunt each and every film festival, causing the instant eye roll from judges -- but none more than the talking head cliche. Avoid the talking head short films where characters sit around a table or location and just banter back and forth. It’s a tempting cliche for filmmakers because it’s easy to shoot and usually requires limited locations, however, it gets boring for audiences. And it gets boring fast. Yes, we’ve all seen My Dinner with Andre. We’ve all seen Before Sunrise. But with all due respect, you’re not Richard Linklater and chances are you’re not going to have Andre Gregory, Wallace Shawn, Ethan Hawke, or Julie Deply caliber actors that can carry such a dialogue heavy short film. The added problem is that the writing all too often doesn’t warrant the type of attention to dialogue either. Give us a story to follow. Take us on a journey. Give us something that engages us. Don’t be afraid to utilize silence and music and atmosphere. Offer some amazing twists and turns. Surprise us. Shock us. Entertain us. Short films can be as long as 45 minutes -- but please, don’t do that. Not for your first few couples of short films at least. 45 minutes -- or even 30 minutes -- is a huge commitment for short film audiences and nine times out of ten it’s less about more story and moreso an example of overwriting and over-directing. You can make a much bigger impact with a shorter running time. And, of course, a shorter running time means that there’s less to film. And when there’s less to film, you can put more focus on those vital story and character moments during production. Less truly is more. Keep everything short, sweet, and to the point. When you cut away all of the fat and offer something lean, audiences are more quickly engaged and the impact of the film is much more memorable because they don’t get lost in unnecessary scenes, sequences, and dialogue. A well fed cast and crew is a happy cast and crew. Chances are these people are working for free and they’re setting aside days upon days of shooting, away from their friends, family, jobs, etc. They’re waiting on you to set up shots. They’re doing take after take. Be sure to put forth a good chunk of your budget for craft services and noteworthy meals. Have a craft service table throughout each shooting day stocked with water, soda, coffee, snacks, and treats -- and get a Costco membership to save you tons of money for bulk purchases. If you’re shooting for a full day, be sure to have a substantial lunch break with either a catered hot meal or an excellent sandwich spread, complete with sides and beverages. If you’re on a micro-budget and shooting into the night, there’s nothing better than pizza at the end of a long shooting day, but also mix it up with a fast food run or home-cooked potluck spread. These people, whether they be few or many, are working hard to accomplish your vision. If you feed them well with noteworthy snack spreads, treats, and meals, they’ll see your appreciation and will follow you anywhere. And Peanut M&Ms are always a hit. It’s very tempting to fall under the spell of taking that stereotypical role of the dictator that has final rule over all. Yes, as a director, it’s your ship. You have the responsibility of all aspects of the production on your shoulders. But you need to be overly collaborative with your cast and crew -- at this stage especially. Let your cinematographer come in with some ideas. Ask them how they think the shot should look. Let your cast come in with some ideas as well. Give them some freedom with their characters. Allow them to question some of the choices made within the script. Trust the lighting and sound people to do their job. Trust your editor and their instincts. Trust them all and listen to them. Surround yourself with talented people that you can find online, at universities and theater companies, etc. Don’t be afraid to work with strangers that clearly have a talent or skill that you can benefit from. Film is a collaborative art form. Even Martin Scorsese, Steven Spielberg, and Woody Allen have to rely on their respective collaborators to make their films the classics they usually end up being. They rely on their cast and crew to do their part and to bring their talents and viewpoints to the table. In short, you can’t do it alone. This is advice straight from the mouth of indie cinema icon Edward Burns. To shoot a short film on a tight budget, you can’t spend all of your money on locations, props, wardrobe, etc. You must beg and borrow. Find locations that are visually enticing and go to owners and just ask. 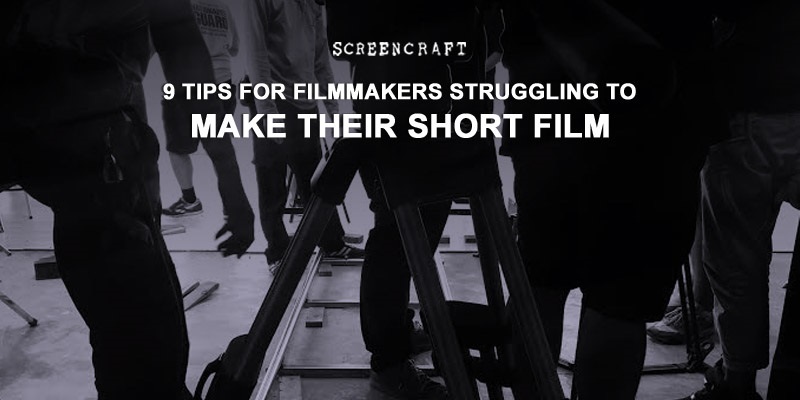 Tell them you’re shooting a film and offer to put them in the credits and, if it’s a business, offer to feature their storefront in an establishing wide shot or something. Never be afraid to just go and ask. People love movies and many will be thrilled to be part of that process. Shoot in your parents house, your friend’s apartment, your high school, your job location, etc. Have your actors come up with their own wardrobe and do their own makeup. Have your aunt that’s a great cook cater some of the cast and crew meals. Have your uncle or cousin that’s a carpenter build some props or sets. Whatever it takes, you can’t be afraid to beg and to borrow. If your budget is tight, you can’t be afraid to ask for handouts. And don’t be afraid to take some shots in the dark. If you know someone that knows a working actor in Hollywood, don’t be afraid to approach them for a role in your film -- it could truly be a game changer if they accept. You’d be surprised how often shots in the dark pan out. True story. Back when I was working as a studio liaison for Sony, a co-worker of my wife was shooting a micro-budget short film and asked me for some guidance as a producer. I knew that they needed a diner location and knew that attaining a diner out in the real world would likely be a difficult venture. So I went to the powers that be at Sony -- including the stage managers -- and told them I was producing a short film and was wondering if there was any chance that the cast and crew could come shoot for a full weekend day on location at the Sony restaurant (where executives dined) and throughout the entire Sony lot as needed. Normally, the expense for such would have been tens of thousands of dollars, but because I asked and used my relationships, the studio gave us full access to the lot AND to the grip department which housed thousands upon thousands of dollars worth of lighting and sound equipment. And we got it all for free. Needless to say, the cast and crew were thrilled to be shooting their micro-budget short film on a major studio lot with free reign for upwards of 16 hours next to gigantic stages that housed hundred million dollar movie productions. Don’t be afraid to beg, borrow, or use any and all relationships. These nine tips are just the tip of the iceberg as far as what it takes to get that short film made. Obviously you have to be well prepared with each and every shooting day, complete with shot lists, storyboards in some cases, and page breakdowns for the actors to let them know what to prepare for with any given shooting day. Filmmaking is hard, whether it be for a feature or a short film. If it’s easy, you’re not doing it right. But you can certainly makes things easier on yourself by following these nine tips and seeking out more advice and tricks of the trade from other filmmakers that have been through many rodeos of their own. And if you’re looking for a chance to get your short film funded, look no further than ScreenCraft’s Short Film Production Fund!